It may be a “duh” statement, but since we are super into plants, we are also really into planters. One type of planter that we haven’t tried yet is a fabric planter, so I thought it would be a fun challenge to figure out how to make one. I lined the bottom of my planters with plastic and used a waterproofing spray on the fabric so it’s a little more water-friendly when giving the plants a drink, but you could also skip those steps and throw the planters in the wash as needed. Ready to make one? Lay your two fabrics on top of each other and cut out a rectangle of fabric that is 18″ tall and 30″ wide. Place the fabrics so that the right side of each fabric is facing each other. Pin the fabric in place across the top width of the fabric. Use a sewing machine to sew across the top width of your fabric with a 1/2″ seam allowance. Once sewn, flip your fabric over so the patterns face right side out, and iron your top seam flat. On the right edge of your fabric, use your iron to press a 1/2″ hem on the front and back fabric panels. Fold your right edge with the pressed hem towards the middle of your fabric, and fold the left side of the fabric towards the middle as well until the sides meet. Tuck the first 1/2″ of the unpressed left side of the fabric in between the ironed hem on your right side. Pin in place. Sew down your fabric to attach the sides together. You should now have an open cylinder shape with your inside fabric facing outward at this point. 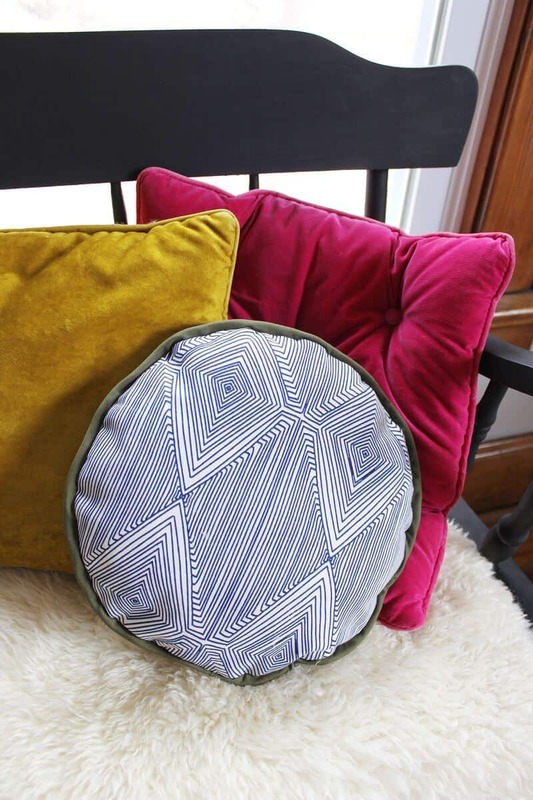 Layer your plastic liner with your bottom fabric, and cut a circle that is 10 1/4″ wide (your circle diameter is really 9 1/4″ with an additional 1/2″ seam allowance all the way around). Line up the two circles layers (with the liner side facing out) and pin the circle all the way around the bottom of your cylinder. Use your sewing machine to sew all the way around the bottom circle with a 1/2″ seam allowance. Once done, turn your fabric bag right side out. Fold the top part of your fabric over to make the planter as tall as you like for your plant. Use the eyelets and a pen to trace where you want to install your eyelets (I placed mine in the middle of the fold about 3″ apart). Use scissors to cut an “X” on that spot, and use a hammer to install each eyelet following the eyelet kit directions. Repeat the process on the other side. Thread rope through the eyelets, and make a knot on the inside of the planter (before cutting the rope, wrap the spot with masking or electrical tape so the rope doesn’t unravel). Spray the outside and inside of your planter with waterproofing spray for extra protection (if you want to), and you’re done! For more protection from water, you can place one of those plastic trays or cork circles at the bottom of the planter before adding the plant (either way, keep the plant in the plastic container you buy it in). If you do this step, make sure you measure the tray or cork before making your planter so it will fit inside your measurements. These are so cute! Instead of a fabric liner, do you think you could use an oil cloth fabric? I’ve got a few yards I’m trying to work through right now. What a wonderful project again! It looks really good! I can’t wait to give this a try! amazing idea as always, thank you for share..
What type of plant is the tall one with the two big stalks? I love its tropical look! awww! first I thought it was the kivet pattern by marimekko! looks beautiful! This looks great! Perfect way to get rid of boring pots/plastic containers. Wow i love it and i need it ! I move a lot, i don’t have many things but i have a little precious tree who is definitivelly always on his way with me ! 🙂 it will be very useful to have this fabric planter ! How adorable. The polka-dots are especially cute. 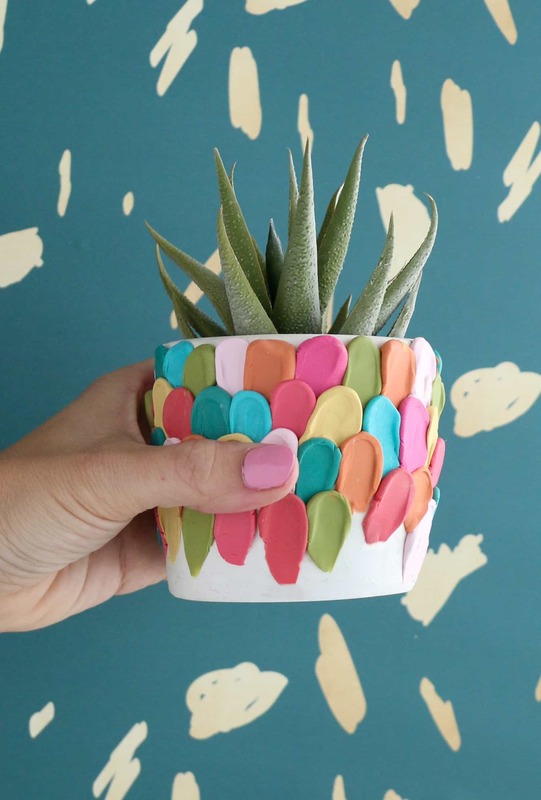 Dying over the polka dot planter. Thanks for sharing! These are SO cute! I actually get kind of sick of looking at typical plant holders, so I love these! I love this project and will definitely be trying it..on a side note, can you tell me the nail polish that you’re wearing? It is such a pretty color! Thanks for all of the inspiration! I love plants and LOVE this DIY. I cannot believe you actually made that! Love you for your creativity, not to mention the level of quality of those planters. Neat idea, impressed it’s a full DIY. I wish I was talented at all with sewing, but id have to go to the store to pull something like this off. Great tutorial. I have a plant I love but a pot I hate and I’m too scared to transplant it! Definitely trying this. I too have the perfect oil cloth. love these! they could also make a boring clothes hamper basket less out of place! If it ever comes to be, I’d like to keep mr.mike’s in the bedroom so something like this would be great! much more cool looking than wicker. I love the fabrics you chose! Fabric containers of all sorts are some of my favorites! These are so sweet! What a fun way to incorporate pattern! Wow! this turned out fantastic! I really enjoy the texture and comfort that it adds to the space. I have a couple of these I’ve made, and all I’ve done is put an old dinner plate under the plastic pot inside the fabric, just the way I would do it if the fabric cover wasn’t there. I’m sure one of those plastic plant trays would work great too, I’m just impatient and lazy! I didn’t do any additional waterproofing and I haven’t had any trouble, because I make sure not to overwater my plants to the extent that it would flood over the dinner plate/plastic tray inside. Glad you made a tutorial, these are seriously the easiest and cheapest planters I’ve ever encountered! What a great idea – especially if you have a really large plant. This is a pretty cool idea. You’re projects are very creative and awesome. Keep it up. Love it! I think they can be used as storage bins also! Wow! Amazing idea! Sometimes we spend months searching for a perfect planter which matches our home style while we can easily make it according to our courtains, sofa or any other fabric we have at home. Very nice idea and a great tutorial. I would, however, like to see how you finished off the cording ends so they would not unravel. Can you please share? Thanks for the great tutorial. You did not mention how you finished off the cording ends so they would not unravel. Can you share? Thanks. These are gorgeous!! Amazing job! Hi Rasa! You could burn the ends with a lighter, but I just taped around the rope where I wanted to cut and cut in the middle of the tape. It should keep it together pretty well. So very cute. I think I’ll go outta the box and make them for my great Nieces for their toys! They have so many “little” toys this will be perfect! Love this. My great aunt has a lot of plants and she would love this. I have to show he this DIY. Thanks for sharing! Laura, I have said it before, but I have to say it again: You are a gem! These are great. Such a well done and clean project, can’t wait to try. Nice idea of covering some plane vases. It´s easy to sew, can choose patterns you love, and, what´s quite important too, this bags protect wooden floor. Thx a lot for sharing the idea. These look amazing! Would love to make at least one. Thanks for sharing!